It’s been a winding road during Brett Connolly’s NHL career, but he’s finally arrived somewhere he hopes to stay. 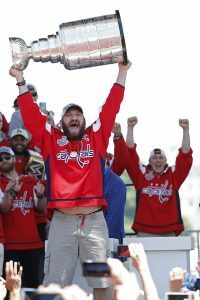 The Washington Capitals forward spoke with Chris Kuc of The Athletic (subscription required) and indicated that he hopes to re-sign with the team and avoid becoming an unrestricted free agent. Connolly will turn 27 in early May and is the final season of a two-year deal he signed with Washington in 2017. Arriving in Washington has been great for Connolly’s career, and this season has been his best so far. With 16 goals and 35 points in 66 games he has already set new career-highs and is seeing more ice time than ever before. That comes after a Stanley Cup run with the team in just his second trip to the playoffs, one that saw him record nine points in 24 postseason contests. Originally selected sixth overall by the Tampa Bay Lightning, Connolly played just 134 games for that organization before ending up with the Boston Bruins. After failing to receive a qualifying offer from the Bruins he landed in Washington as a player many saw as a bust given his high draft pedigree. Connolly had just 59 points through his first 210 NHL games and hadn’t suited up for a single playoff game. With the Capitals that has all changed. Unfortunately though, success comes at a price in the NHL. The Capitals are pushed right up against the salary cap ceiling this season and will have to make tough decisions this summer on how to move forward with this core. Players like Andre Burakovsky, Jakub Vrana and Christian Djoos are all restricted free agents that need new contracts, while the only money really coming off the books is a few million owed to Brooks Orpik and Carl Hagelin. If Connolly is looking for a raise after his career season there may just not be enough room to fit everyone in. Still, there are definitely ways to keep Connolly in the picture and at his relatively young age the Capitals will likely explore every opportunity. Those discussions will be up to GM Brian MacLellan to start, as Connolly and agent Gerry Johannson have decided to wait for the Capitals to approach them—something that does not appear to have happened yet. The New York Islanders may have come out of last night’s performance with a loss, but it definitely didn’t feel like one. For one, the team’s offense, particularly the power play, seems to have hit its stride and the team finds itself putting up solid numbers. A lot of that credit goes to their top line of John Tavares and Anders Lee. However, it’s the third man on that line that deserves quite a bit of credit, according to Newsday’s Arthur Staple, who gives much of the line’s success to Josh Bailey. Bailey has been the key to the team’s offensive firepower, especially on the power play and has helped fix that power play which started the NHL season at a 0-for-20. The scribe points out that while Tavares and Lee have combined for five of the team’s nine goals, all coming since their Oct. 19th game against the New York Rangers, it is Bailey’s passing work that has made the difference. The 28-year-old winger is among NHL leaders with six power play assists since then and has had nine assists in the last four games, giving him 13 assists this season. In fact, since the start of last year (the 2016-17 season), Bailey has racked up 56 assists and only 10 players in the NHL have more than him, including names like Connor McDavid, Erik Karlsson, Patrick Kane and Niklas Backstrom. Unfortunately, for the Islanders while that’s great to see him taking that next step, its also another cause for concern as he is in the last year of a five-year, $16.5MM deal. He undoubtedly will expect a raise, likely a significant one and suddenly along with Tavares, the team will have their work cut out for them this offseason. Jason Mackey of the Pittsburgh Post Gazzette writes that Pittsburgh Penguins’ fourth-line wing Carl Hagelin is well aware that his offense needs to step up. The recently scratched wing has struggled this year offensively. While he’s never been an offensive juggernaut, the 29-year-old has struggled with just a goal and an assist in 14 games. Add that to the $4MM the team owes his this year and next year, his struggles even stand out more. Mackey writes that it’s his shooting percentage that has fallen off a cliff since last year. His 4.4 percent shooting percentage is way down from his earlier career averages of 9.4 percent. Mike Vogel of NHL.com writes that the Washington Capitals’ line of Lars Eller, Tom Wilson and Chandler Stephenson is thriving in the three games that they’ve been paired together. Eller and Wilson have played together quite a while, but it has been the addition of Stephenson, who replaced the injured Brett Connolly that has made the difference in the line. The 23-year-old might finally be breaking into Washington’s lineup after only playing in 13 games combined in the last two years. So far, his one goal and two assists in four games looks solid. In the three games, the Eller-Wilson-Stephenson line has posted three goals and eight points, the most of all the Capitals lines. The success of the back-end line is welcome since the top six lines have struggled recently. While he is still a long way from returning to the lineup, Devils center Travis Zajac took a step forward in his recovery on Friday in the morning skate for the first time since undergoing surgery to repair a torn pectoral muscle back in mid-August. However, head coach John Hynes was quick to caution to Andrew Gross of The Record that he still has a long way to go and that there’s no updated timeframe yet for his return. At the time of the surgery, Zajac was expected to miss four-to-six months but if he doesn’t experience any setbacks as he begins to skate, he could potentially push to be back for the shorter end of that timeline. The Capitals will likely be without winger Brett Connolly for at least the next two games as he has been placed into concussion protocol, notes Isabelle Khurshudyan of the Washington Post. Anthony Peluso, who was recalled yesterday, is likely to take his spot on the roster while Tyler Graovac (upper-body injury) was transferred to injured reserve. The Ducks have activated goaltender Ryan Miller off IR, reports Eric Stephens of the Orange County Register. The netminder is expected to serve as the backup tonight and then potentially make his first start of the season on Sunday. Miller is in his first season with Anaheim after signing a two-year deal with them in free agency but suffered a wrist injury in the preseason and has yet to suit up in a regular season game in 2017-18. Also coming off the IR in Anaheim is blueliner Sami Vatanen, Stephens notes in the same column. He has missed the entire season so far after undergoing surgery in May to repair a torn labrum in his shoulder. His return to the Ducks’ lineup comes at a great time with Cam Fowler (knee) and Kevin Bieksa (hand) both dealing with injuries. After leaving Friday’s game with an upper-body injury, Hurricanes winger Teuvo Teravainen will skate Sunday morning and is listed as a game-time decision for their game against Anaheim, the team announced (via Twitter). Teravainen is off to a nice start in his second season with Carolina, recording five points in the first nine games of the season which ranks him tied for third on the team. This is where the Capitals have gotten themselves into trouble. Playing to win it all for the last couple of years has taken a toll on the depth of the team’s roster as they have chosen to go with veterans rather than allow youngsters to work their way into the lineup. Now that those contracts have become too much and the team has had to purge a number of free agents to stay under the cap, suddenly there is no depth to look to when they really need it. Vrana, a former 2014 first-rounder returned to his team in Sweden after being drafted, but signed at the end of the 2015 season and joined the AHL Hershey Bears for three games, tallying five assists. He then added six points in 10 playoff games to establish himself as a top prospect. He scored 35 goals over the next two seasons in Hershey before being promoted to Washington last year. In 21 games, he tallied three goals and three assists and appears ready to step in to a bottom line role this year. There are a number of minor leaguers that may be ready to step into the lineup such as defenders Madison Bowey and Christian Djoos, but none have seen any NHL action so far in their careers and there is no guarantee they will make the team out of training camp. The team has already lost several key defenseman in the past few months, including Kevin Shattenkirk, Nate Schmidt and Karl Alzner. Could Carlson be next? While the team still has several veteran remaining on their roster, the team might be hard-pressed to avoid losing another veteran defenseman. Currently penciled in to play next to Orlov, at 27 years old, he would be a big loss if the team is unable to bring him back. However, the team will be paying Orpik, Niskanen and Orlov, more than $16MM combined next year. Will Washington find the money for Carlson? Wilson is a player who the Capitals have high hopes for. The 23-year-old wing is a former 2012 first-rounder and has played four years with the team already, usually among the bottom-tier lines. However, with smoe of the team’s losses on offense, including Marcus Johanson and Justin Williams, this might be the year that Wilson breaks out. He is currently penciled in on the team’s second line and while he managed just seven goals a year ago, he did put up three playoff goals, showing he might be ready for an enhanced role. As a restricted free agent in 2018, the team will have some control on managing his salary. Perhaps one of the more interesting decisions the team must make is what they plan to do with their backup goalie. Grubauer is considered to be one of the top-young goaltending prospects and while he was not chosen by the Vegas Golden Knights in the expansion draft, many feel that he could be a solid starting goaltender. However, with Holtby in front of him and locked up for three more years, that role would not likely be given to Grubauer in Washington. With minor leaguer Pheonix Copley looking ready to become the team’s backup and the presence of 2014 second-round prospect Vitek Vanacek and 2015 first-round prospect Ilya Samsonov, the team is loaded with goaltending talent. It seems far more likely the team will move Grubauer at some point, maybe at the trade deadline next season to add much needed depth. Eller is at best a third line center, who averages between 10 and 15 goals per season. Barring a breakout year and he’s already 28 years old so that seems unlikely, Eller at $3.5MM might be too expensive to bring back in a year, but it’s too early to tell. Beagle did have a career year last year and should challenge Eller for that third-line center job with the loser likely to man the fourth line. Beagle, a faceoff specialist, scored 13 goals last year. If the team can bring them back on relatively cheap deals, they might be able to retain them. Chorney was used primarily as an extra defenseman last year and only managed 18 games last season. With the team’s lack of depth after their top four, Washington may have no choice but to give Chorney a chance to win one of the last spots. The 30-year-old did manage to get into 55 games a year ago. Smith-Pelly, a quiet free agent acquisition this offseason, scored four goals in 55 games for New Jersey last year. Their futures will be decided by whether they make the team and how they perform. At 36 now and 38 years old when his contract expires, Orpik’s days could be numbered. 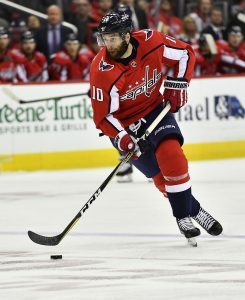 While he’s never been a major offensive presence, his defense has helped anchor a Capitals team for several years since coming over from Pittsburgh, but his skills are already beginning to diminish and this deal is considered by many to be one of the worst deals the Caps have made over the last few years. The player to keep an eye on is Burakovsky, who many believe might have a breakout season now that the team has lightened their forward depth. Burakovsky, a first-round pick in 2013, has 38 goals and 95 points in three seasons and is currently expected to move onto the team’s second line. In two years, he should be a restricted free agent and could ask for quite a contract if he can put together a couple of big seasons for the Capitals. Connolly is another player for the team to keep their eyes on. While the 25-year-old wing had a career year with Washington this year (15 goals, 23 assists), but the team will need to see what he does over the next two before awarding him another deal. Both players would seem like obvious candidates to be brought back in three years, but there are a lot of factors that determine that. Backstrom will be 33, while Holtby will be 30, so both should still be in their prime. Backstrom’s 23 goals and more importantly, 63 assists were critical to the Capitals success this last year, while Holtby is the cornerstone in goal. There is no guarantee that any youth will step in and supplant them although the Capitals are strong in goaltending depth. The Capitals have a great core and the team has obviously planned to put most of their money and years towards Kuznetsov, Oshie and Orlov as well as Ovechkin and Niskanen. The team’s success has revolved around Ovechkin since the day he was drafted and little will change. He is locked up for another four seasons and no one would be surprised if they brought him back after that at age 35. Even though there was some trade chatter about moving on from their star, Washington will likely do everything it can over the next four years to compete for a championship. However, Ovechkin didn’t fare as well this year. After three 50-goal seasons, the 31-year-old wing dropped to a 33-goal season. Still great, but not his usual standard. Can he take his game back to that previous level? The team then inked three of their stars to long-term deals this offseason. Kuznetsov is just 25 and should be solid for years, but was he worth $7.8MM per season? That’s a lot of money for good, but not great production. He suffered a down year compared to his 2015-16 season, but he’s coming off a 19 goal, 40 assist season, the Capitals have to hope he can take his game to the next level and fill in the offense they will lose this year. Otherwise that’s a lot of money spent on an average center. Orlov also was extended this offseason. The 26-year-old defenseman signed a six-year, $30.6MM deal to remain with Washington. He finished the season with six goals and 33 points and may be ready to take over the defensive reigns. Many people thought Oshie would leave during free agency due to the Capitals’ cap issues, but the team found a way to keep the 30-year-old forward, signing him to an eight-year extension at $5.75MM. Whether he will be worth that much in his late 30s is unknown, but his 33 goals last year was a career high. Niskanen remains solid on defense and will be needed even more with some of the offensive losses. The 30-year-old defenseman put up another solid season, scoring five goals and 34 assists for 39 points. The Capitals are a well-run franchise that has done an excellent job of spending money on their core of stars, while drafting well enough to have talent ready to go. They may have overreached themselves this past year as they lost quite a bit of talent and have several gaping holes on defense, but the team seems to have put together a great team that just has not been able to get themselves to the Stanley Cup Finals. Ovechkin still has a number of years left, so expect the Capitals to be aggressive and make moves to add more scoring and more defense over the next year or two. Don’t be shocked to see a goaltender get moved to make room for their prospects, but also to find new talent they can plug into their lineup. 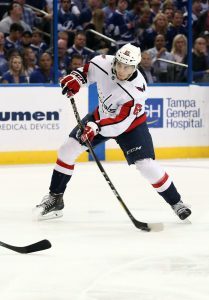 Isabelle Khurshudyan of the Washington Post was the first reputable source to release her team’s protection list, as she confirmed the Washington Capitals’ names not long after the 5:00 PM ET deadline. The lists includes the expected names: Alex Ovechkin, Nicklas Backstrom, Evgeny Kuznetsov, Andre Burakovsky, Marcus Johansson, Lars Eller, Tom Wilson, Matt Niskanen, John Carlson, Dmitry Orlov, and Braden Holtby. While not surprising, the list does not include long-time Jay Beagle, promising young players Nate Schmidt and Brett Connolly, and a oft-rumored target of the Golden Knights, backup goaltender Philipp Grubauer. L.A.-based hockey writer John Hoven got the list of protected players for the Los Angeles Kings, which confirms that they will indeed protect eight-skaters, including four defenseman, rather than the 7/3 protection scheme. Among the safe are Anze Kopitar, Jeff Carter, Tyler Toffoli, Tanner Pearson, Drew Doughty, Jake Muzzin, Alec Martinez, and the key decision, Derek Forbort. Star goalie Jonathan Quick was also obviously protected. While the Kings succeeded in protecting the most valuable players on the roster, they still have left defenseman Brayden McNabb and a large assortment of forwards including Trevor Lewis, Nic Dowd, and Nick Shore open to selection. Sportsnet’s Eric Francis, who covers the Calgary Flames, has some key names for his team as well. Francis confirmed that the Flames did not protect 2016 free agent acquisition Troy Brouwer, but did opt to save younger assets like Sam Bennett, Micheal Ferland, and Curtis Lazar. Although Francis stops there, the rest of Calgary’s list is somewhat self explanatory with newly-acquired goalie Mike Smith, defensive core of Mark Giordano, T.J. Brodie, and Dougie Hamilton, and cornerstone forwards Johnny Gaudreau, Sean Monahan, Michael Frolik, and Mikael Backlund as obvious choices. One not so obvious choice has been made in Nashville. Adam Vingan of The Tennessean answered a question on the minds of many, reporting that the Predators did in fact protect forward Calle Jarnkrok. With the rest of the eight-skater list all but set in stone with goalie Pekka Rinne, defensemen Roman Josi, P.K. Subban, Ryan Ellis, and Mattias Ekholm, and star forwards Filip Forsberg, Ryan Johansen, and Viktor Arvidsson, the final forward spot came down to Jarnkrok, signed long-term, or James Neal, an elite scorer with just one year remaining on his contract. It seems that Neal will be open for selection, alongside names like Colton Sissons, Colin Wilson, and Craig Smith. Vignan adds that no deal has been struck between Vegas and the Predators to protect any of those players, with Nashville especially liking to retain Neal and Sissons. Sportsnet’s Elliotte Friedman reported that, interestingly enough, young Detroit Red Wings defenseman Xavier Ouellet was not protected by his team. This is the first real surprise of the expansion process and the first protection news that doesn’t match up with PHR’s Expansion Primer projections. The 23-year-old skated in 66 games this season for Detroit, third most among defenseman, and his 12 points tied that of top-pair man Danny DeKeyser. Yet, Ouellett will not join DeKeyser and Mike Green in protection, instead beaten out by another teammate. GM Ken Holland, who has gotten the reputation of perhaps being too loyal, possibly chose aging veteran Niklas Kronwall over Ouellet. Hopefully that doesn’t come back to bite the rebuilding Red Wings. Another name confirmed to be unprotected is young Vancouver Canucks center Brendan Gaunce. Vancouver sports anchor Rick Dhaliwal was told that that Gaunce, a 2012 first-round pick, did not make the protection list for the Canucks, expected to be a 7/3 format, meaning that the team saw him as outside the top seven forwards on the team. The 23-year-old two-way specialist has upside, but after registering just five points in 57 games last season, no one will blame Vancouver for that choice. Rangers goaltender Henrik Lundqvist told SportExpressen’s Magnus Nystrom (link in Swedish) that he suffered an injury to a ligament in his knee while playing for Sweden at last month’s World Championships. NHL.com’s Dan Rosen clarifies (via Twitter) that it’s an MCL sprain. The rehab time is expected to be four to six weeks. The netminder added that he plans to get back to on-ice workouts in early August. The 35 year old didn’t specify when the injury occurred but he noted he had it before suiting up in the final game against Canada. The issue didn’t appear to hold Lundqvist back in any form as he had a strong showing for the gold medallists, posting a 1.31 GAA and a .946 SV% in five games after joining the team midway through the tournament. He was particularly sharp in that final match, allowing just a single goal while not allowing any goals in the shootout. The Capitals are interested in re-signing pending RFA winger Brett Connolly and in fact have come close to reaching an agreement a couple of different times with him, reports CSN Mid-Atlantic’s Tarik El-Bashir. Simply receiving his qualifying offer (worth just over $892K) would be a nice change of fortune for him after not being tendered one by the Bruins last summer. The 25 year old set a career high in goals this season with 15 in 66 games and fit in nicely on the third line for a significant portion of the year. However, he found himself in the doghouse in the postseason and was a healthy scratch for their final six games. Flyers GM Ron Hextall has already tabled a qualifying offer to pending RFA Shayne Gostisbehere, notes CSN Philly’s Tim Panaccio. Hextall wouldn’t comment on the status of negotiations, only commenting that he’d like to have a deal done before training camp starts in September. After a quieter sophomore campaign that saw him as a healthy scratch at one point, Gostisbehere could be in line for a bridge contract instead of a long-term deal. The Canadiens will not ask either of their players with no-move clauses to waive them in advance of expansion, John Sedgwick (Montreal’s director of legal affairs) told Hugo Fontaine of the teams’ official website. Goalie Carey Price wasn’t going to be left unprotected either way but defenseman Jeff Petry, who has four years left with a cap hit of $5.5MM, could have been a candidate if the team wanted to protect both Jordie Benn and Nathan Beaulieu.